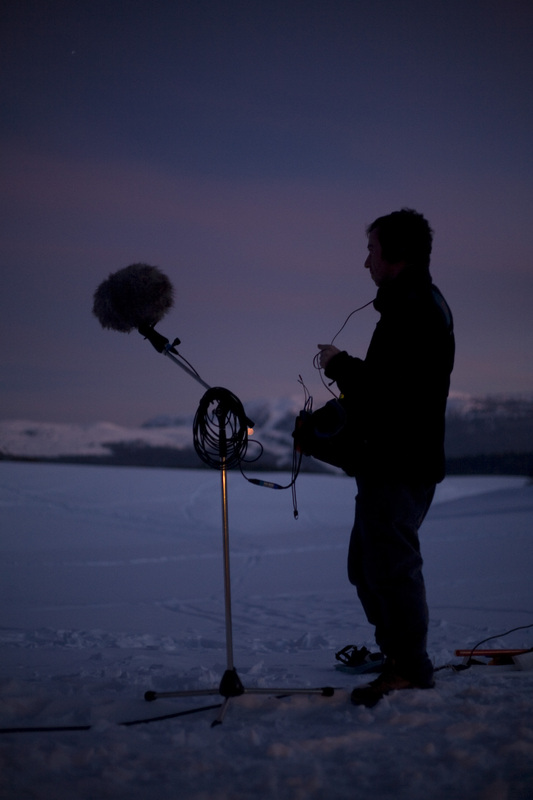 Aaron Einbond’s work explores the intersection of instrumental music, sound installation, field recording, and technology, bringing the spontaneity of live performance together with computer interactivity. His recent music has focused on audio transcription as the center of a creative process bridging composition, improvisation, and interpretation, questioning the thresholds of perception between instrument, stage, room, and loudspeaker. Recently Chicago-based Ensemble Dal Niente released his portrait album Without Words on Carrier Records, SWR Experimentalstudio produced his Giga-Hertz prizewinning Cartographies for piano with two performers and electronics for the 47-loudspeaker Klangdom at ZKM in Karlsruhe, and the Académie du Festival d’Aix and Opera Lab Berlin co-produced his site-specific ambient chamber opera Hidden in Plain Sight in the streets of Aix-en-Provence. Upcoming projects include a concert-installation for Yarn/Wire and collaborations with TwoNewDuo and loadbang. He teaches Music Composition, Sound, and Technology at City, University of London and is Co-Artistic Director of Qubit New Music Initiative with whom he curates and produces experimental media in New York. Einbond has received a John Simon Guggenheim Memorial Foundation Fellowship, an Artistic Research Residency at Ircam in Paris, and taught at Columbia University, the University of Huddersfield, and Harvard University. He was born in New York in 1978 and studied at Harvard University, the University of Cambridge, the University of California Berkeley, and Ircam with teachers including Mario Davidovsky, Julian Anderson, Edmund Campion, and Philippe Leroux. Aaron Einbond’s work explores the intersection of instrumental music, sound installation, field recording, and technology, bringing the spontaneity of live performance together with computer interactivity to impact and challenge the listener. His recent work has focused on audio transcription as the center of a creative process bridging composition, improvisation, and interpretation, questioning the thresholds of perception between instrument, stage, room, and loudspeaker. He is the recipient of a John Simon Guggenheim Memorial Fellowship, a Giga-Hertz Förderpreis, and awards and commissions from the Fromm Music Foundation, the American Academy of Arts and Letters, BMI, ASCAP, Meet the Composer, the French American Cultural Exchange, the Internationales Musikinstitute Darmstadt, the Hochschule für Musik Franz Liszt Weimar, as well as a Fulbright Scholarship, a British Marshall Scholarship, and the Georges Ladd Prix de Paris. Recently Chicago-based Ensemble Dal Niente released his portrait album Without Words on Carrier Records, SWR Experimentalstudio produced his Cartographies for piano with two performers and electronics for the 47-loudspeaker Klangdom at ZKM in Karlsruhe, and the Académie du Festival d’Aix and Opera Lab Berlin co-produced his site-specific ambient chamber opera Hidden in Plain Sight in the streets of Aix-en-Provence. Other collaborators include ensemble recherche, Yarn/Wire, TAK, Cairn, L’Instant Donné, L’Itinéraire, Le Balcon, Mosaik, SurPlus, neuverBand, Eco, Earplay, Empyrean, Left Coast, Argento, Nouvel Ensemble Moderne, Freiburger Barockorchester, Pierre Morlet, Séverine Ballon, Seth Woods, Heather Roche, Simone Beneventi, Ryan Muncy, Kobe van Cauwenberghe, Antonio Politano, Ircam Festival Agora, ZKM Imatronic Festival, Huddersfield Contemporary Music Festival, Acht Brücken Cologne, Musikfestival Bern, Darmstädter International Summer Course, Festival MANCA, Music Biennale Zagreb, the Greenwood Orchestra, the Cleveland Institute of Music Orchestra, the New York Chamber Symphony, the Long Island Philharmonic, and the Cincinnati Symphony. Upcoming projects include a concert-installation for Yarn/Wire and collaborations with Two New Duo and loadbang. He was born in New York in 1978 and has studied at Harvard University, the University of Cambridge, the Royal College of Music London, the University of California Berkeley, and Ircam in Paris with principal teachers Mario Davidovsky, Julian Anderson, Edmund Campion, and Philippe Leroux. From 2009-2011 he was Mellon Postdoctoral Fellow in Music at Columbia University, from 2012-14 he was Research Fellow at the Centre for Research in New Music (CeReNeM) at the University of Huddersfield, in 2014 he was Visiting Lecturer on Music at Harvard University, and in 2014-15 he was Artistic Research Resident at Ircam. He currently teaches Music Composition, Sound, and Technology at City, University of London. As a researcher in computer music he has published in the Computer Music Journal (CMJ) and Open Music Composer’s Book, and presented at the International Computer Music Conference (ICMC), Society for Music Theory (SMT), Electroacoustic Music Studies Network (EMS), Sound and Music Computing (SMC), Music and Genre, and taught masterclasses at the Conservatoires of Nice, Blanc-Mesnil, and CNMAT at U.C. Berkeley. As an electronic music producer and improviser he has performed with Ensemble Dal Niente, the San Francisco Contemporary Music Players, Ensemble Aleph, Ensemble Cairn, the American Composers Orchestra, Ensemble Dal Niente, and SonicExchange Kassel. He is Co-Artistic Director of Qubit New Music initiative with whom he curates and produces experimental media in New York, including the Qubit Noise Non-ference in 2013. The same year he co-organized the symposium Noise In And As Music in Huddersfield and co-edited the accompanying book published by the University of Huddersfield Press.